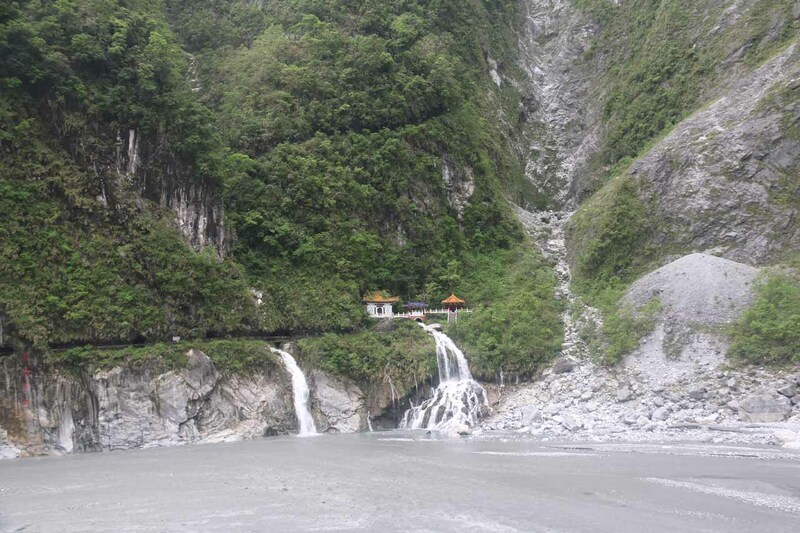 The Taroko Gorge Waterfalls (太魯閣的瀑布 [Tàilǔgé de Pùbù]) were my excuse to celebrate the many unnamed and named waterfalls in this web page. 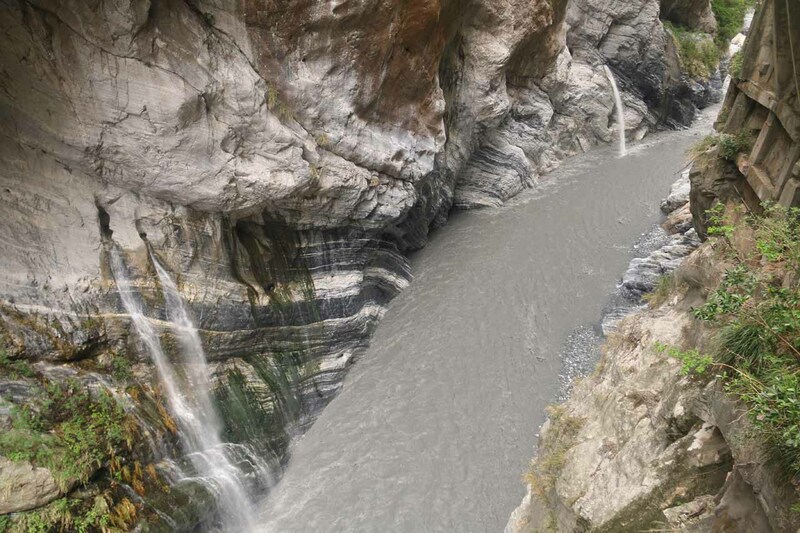 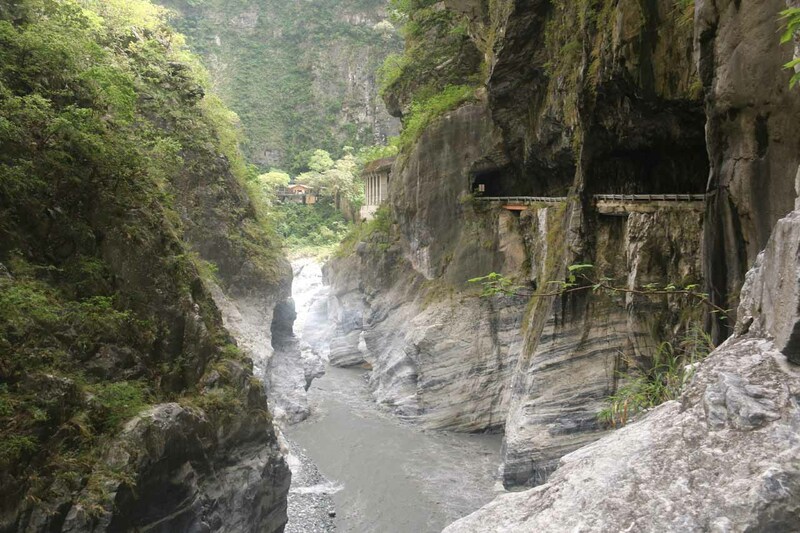 The Taroko Gorge itself was perhaps Taiwan’s most famous natural attraction as it featured very tall vertical-walled gorges composed of marble and cut primarily by the Liwu River (立霧溪 [Lìwū Xī]). 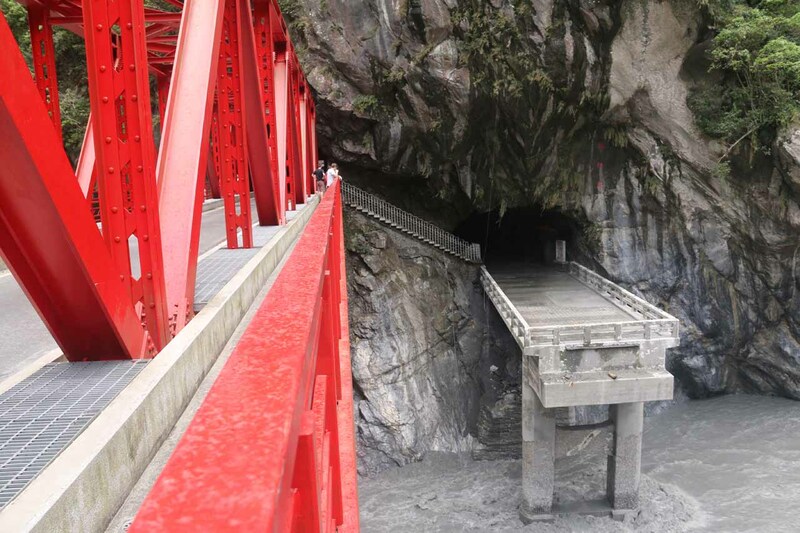 We took part of the Cross-Island Highway (Hwy 8) that went within the gorge making for a vertigo-inducing and neck-cranking experience. 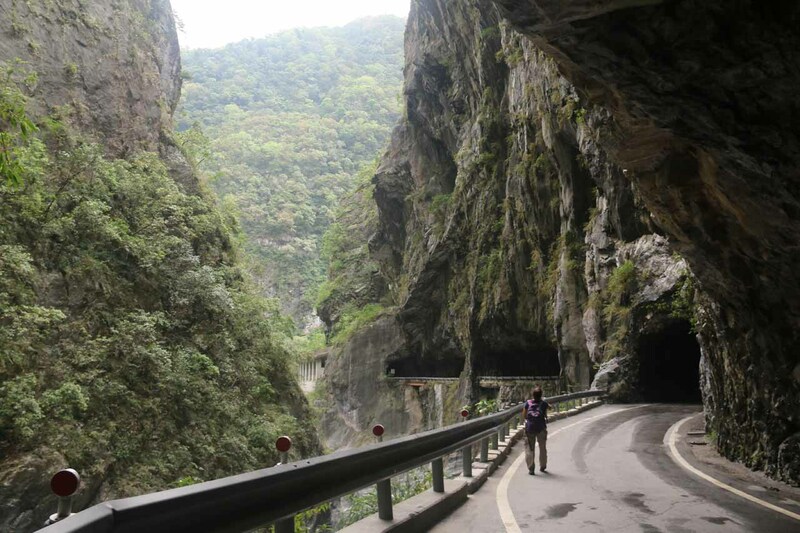 In a way, it reminded me very much of the Cares Gorge in Spain as they both featured roads or trails that used to be created for the purposes of hydroelectricity. 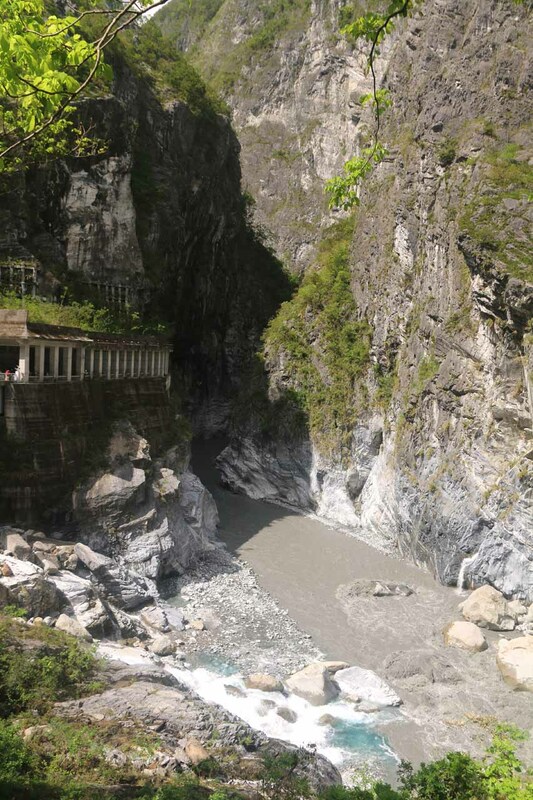 The Taroko Gorge felt a little more developed because they let vehicular traffic (including tour buses) through the narrow roads while the Cares Gorge was foot traffic only. 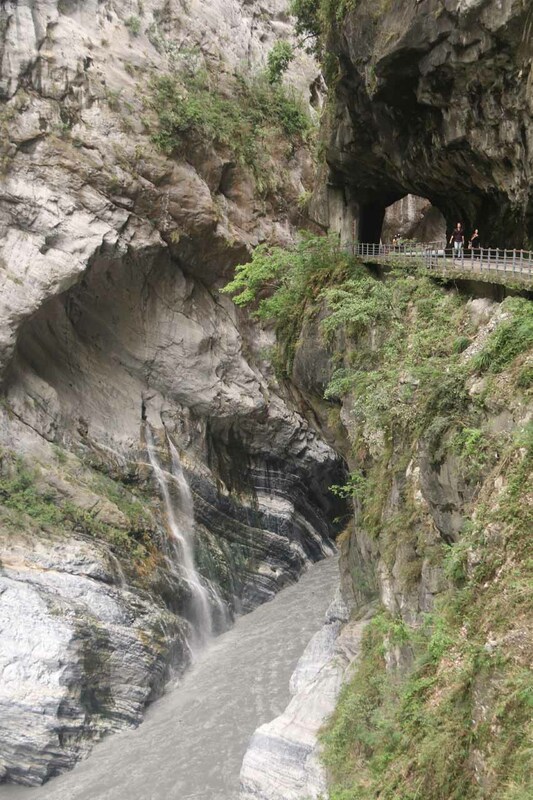 Nonetheless, they both featured many tunnels and suspension bridges as well as a series of waterfalls plunging right into the depths of the gorge. 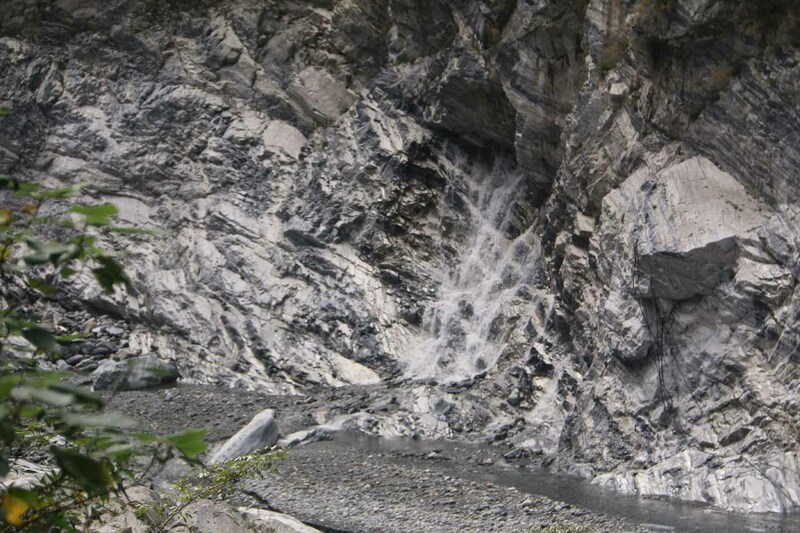 Perhaps from a waterfalling standpoint, the waterfalls of the Taroko Gorge were more legitimate as they weren’t primarily caused by overflow spillage from ditches like in the Cares Gorge. 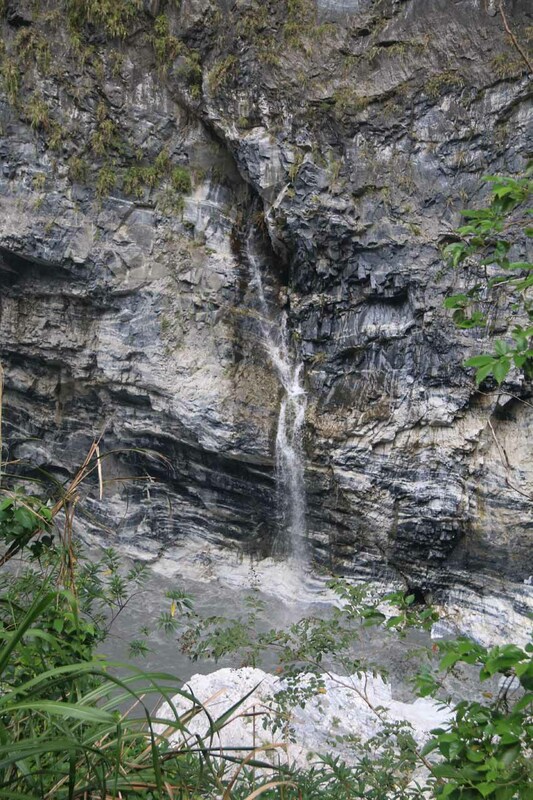 Instead, many of these waterfalls came from springs where water would emerge from potholes within the marble in addition to the conventional waterfalls tumbling down grooves and gullies in the cliffs as well. 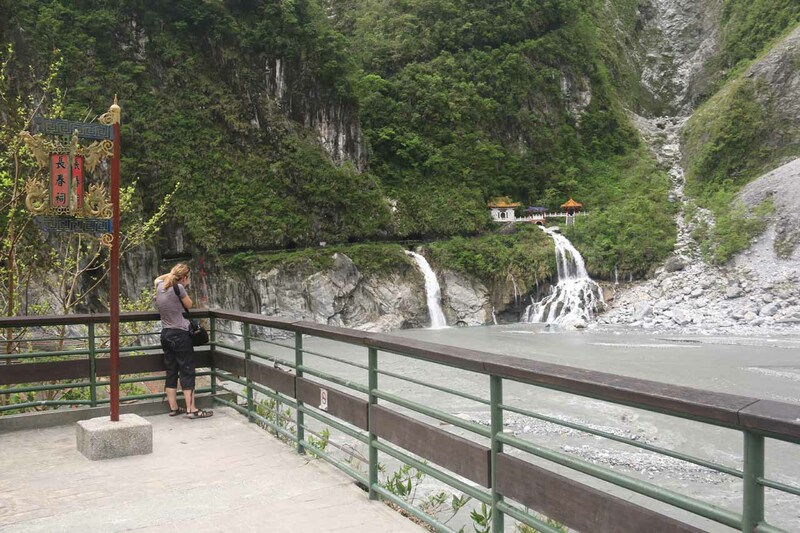 During our visit in October 2016, we aimed to visit the Baiyang Waterfall, which was perhaps the most significant of the waterfalls in the Taroko Gorge. 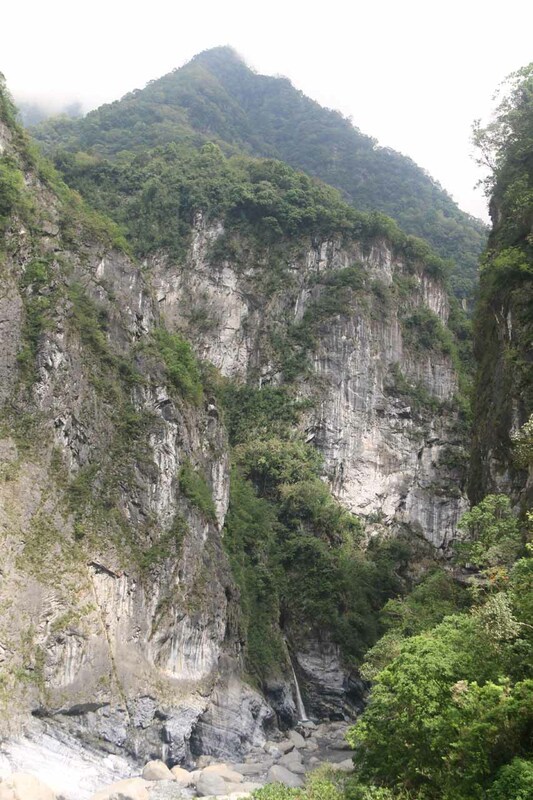 Unfortunately, the verticality of the gorge combined with the unusually warm Summer and Autumn (it still felt like Summer during our end-of-October visit) resulted in several thunderstorms and typhoons that battered Taiwan and resulted in landslides that limited access along Hwy 8 while also closing the trail to the Baiyang Waterfall (we couldn’t even get to the village of Tianxiang [天祥 or Tiānxiáng]; meaning “thinking of Heaven”, I think). 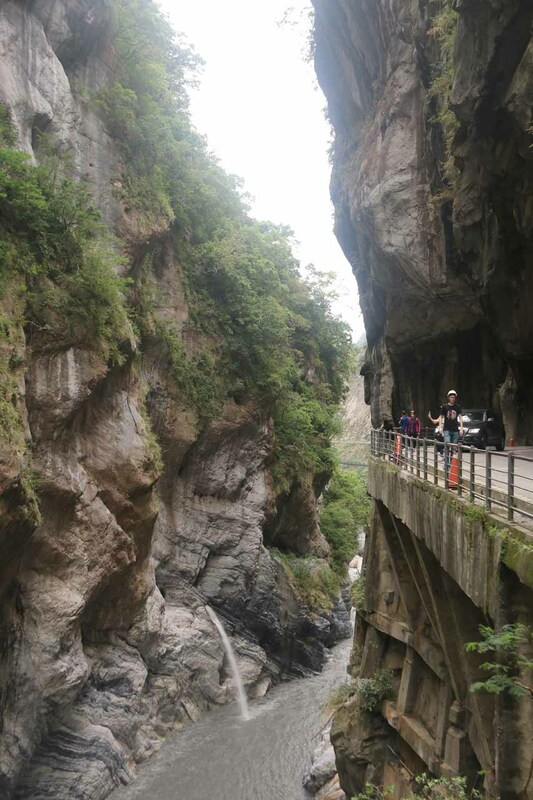 The Taiwan government provides updates for road conditions and trail conditions, which we found useful as we were anxiously hoping against hope that the Baiyang Waterfall Trail would open when we’d showed up. 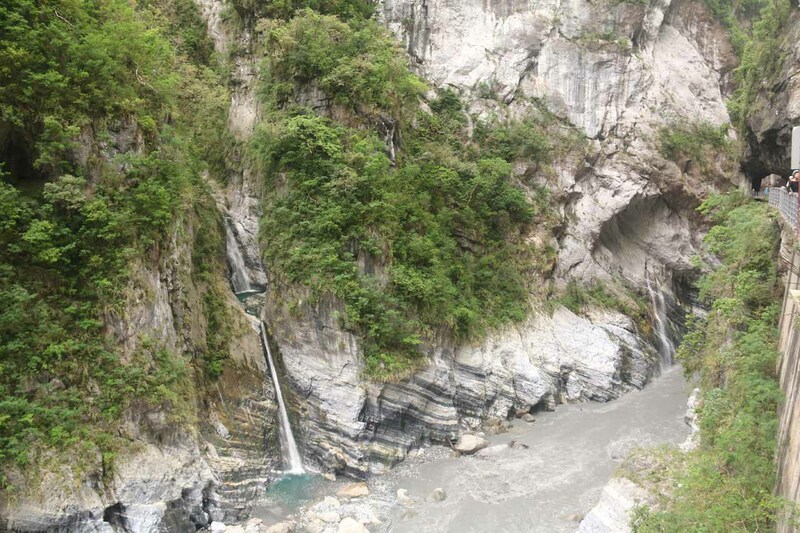 But alas, our visit was limited to a small section of the Taroko Gorge (focusing primarily on the Swallow Grotto portion) where we encountered mostly unnamed waterfalls. 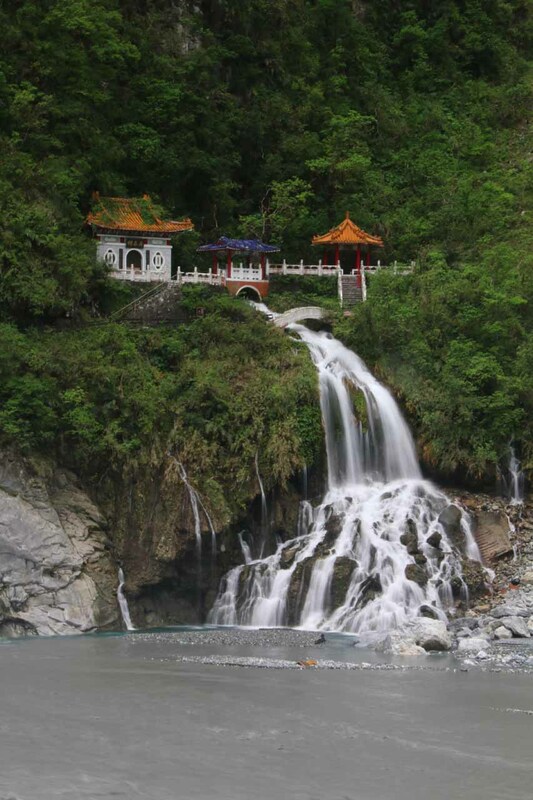 We also stopped by the permanent waterfall tumbling beneath the Shrine of the Eternal Spring (長春祠 [Chángchūn cí]; see picture at the top of this page). 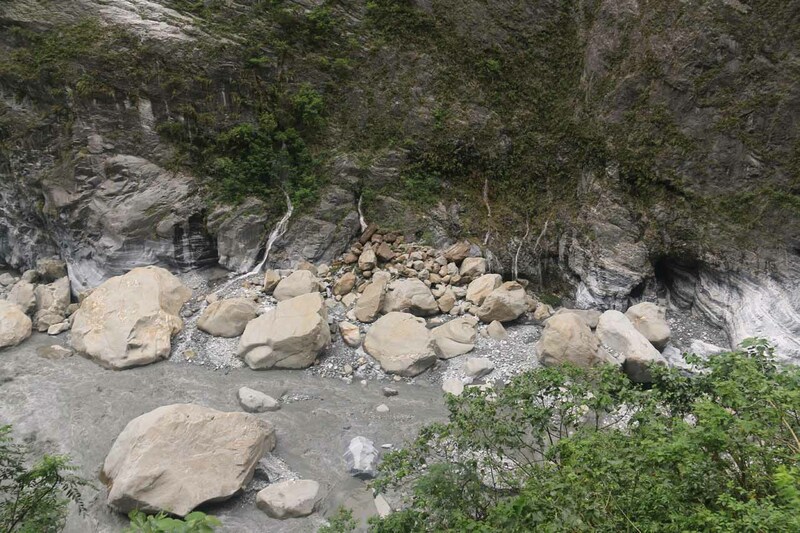 I acknowledge that we really need to come back and do a repeat visit under more benign conditions, but until that happens, what you see here is all we can show you. 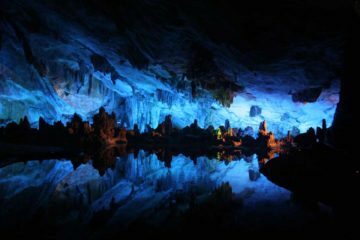 That said, even just what we’re showing on this page gives you a glimpse of the kind of scenery that made this place famous internationally. 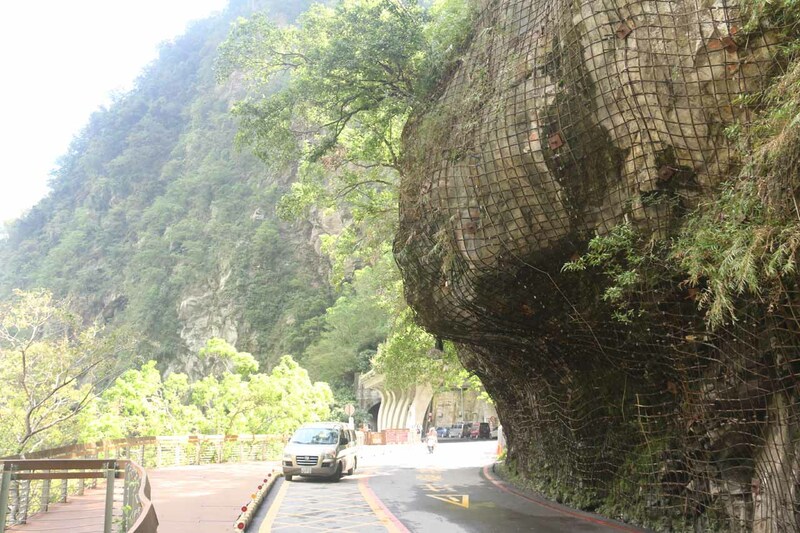 Our visit pretty much involved driving as deep into the Taroko Gorge as we could (given the circumstances). 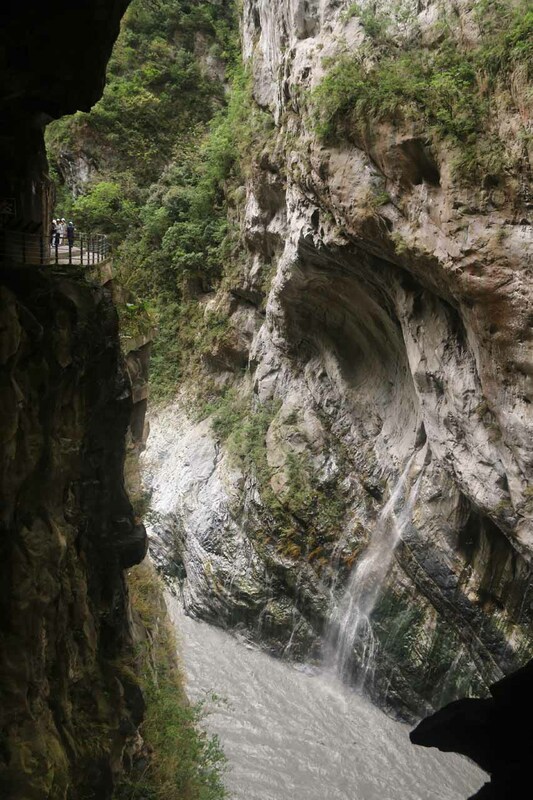 We ultimately stopped the car at the Swallow Grotto (燕子口 [Yànzǐkou]) area and walked around the immediate area. 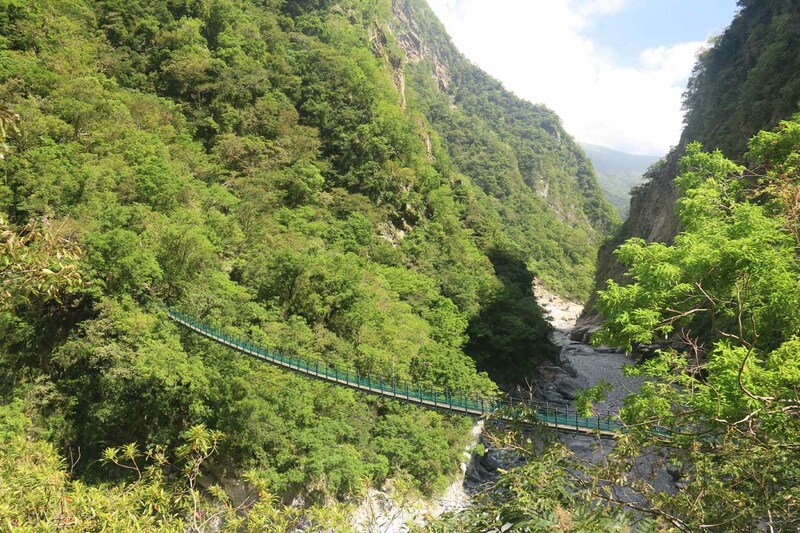 We wound up walking about a length of 2.6km round trip (or 1.3km in each direction), and this was reflected in the walking difficulty rating you see at the top of this page. 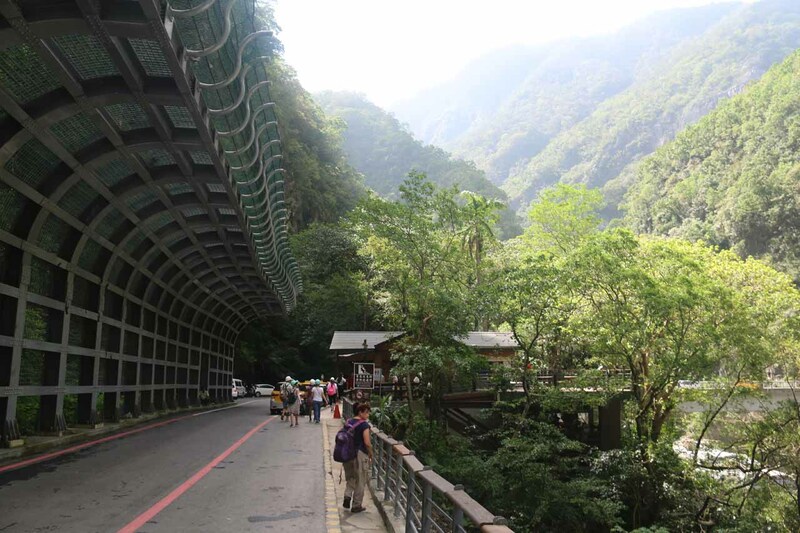 The rest of our time spent at the Taroko Gorge was pretty much auto-touring where the remaining attractions as we headed back towards the east were roadside attractions (like the Eternal Spring Shrine). 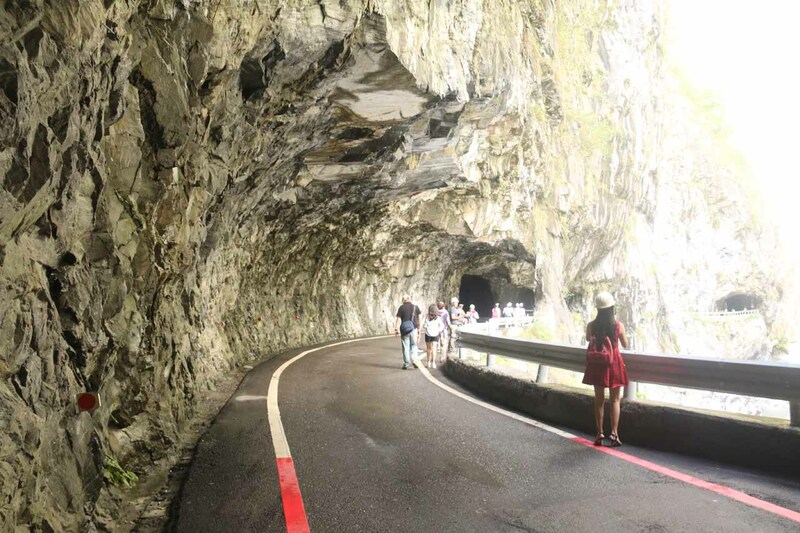 Parking was only available in designated spots (basically where the lines along the road were not red; see directions below). 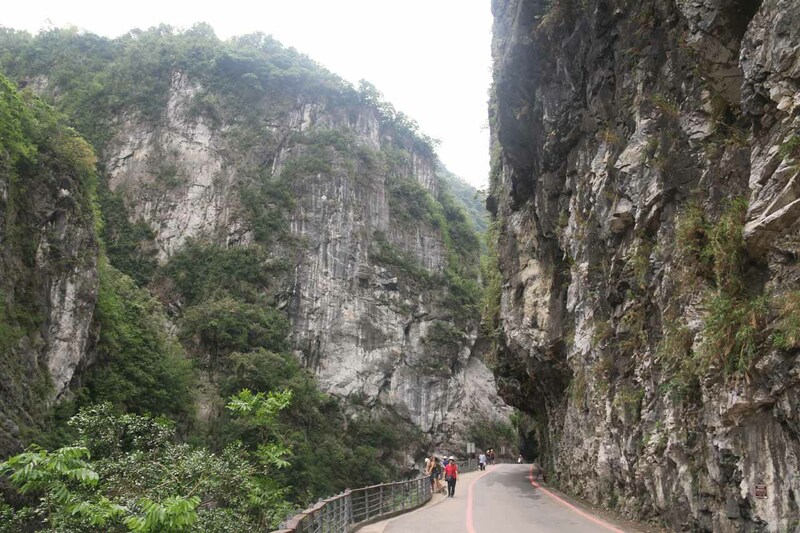 It took us over an hour to do the roadside walk with frequent photo stops. 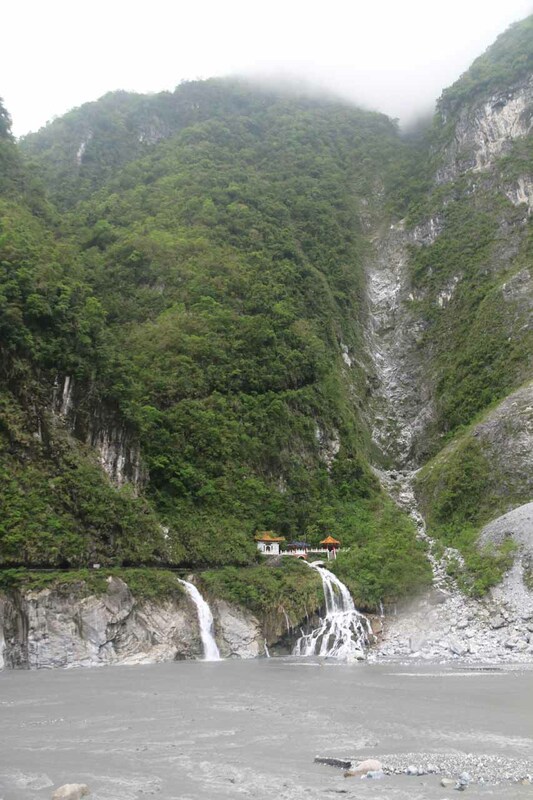 For the Shrine of the Eternal Spring, there was definitely a fair bit of parking spaces to take in this spot (see directions below again), but the trail to get right up to the shrine was closed during our visit. 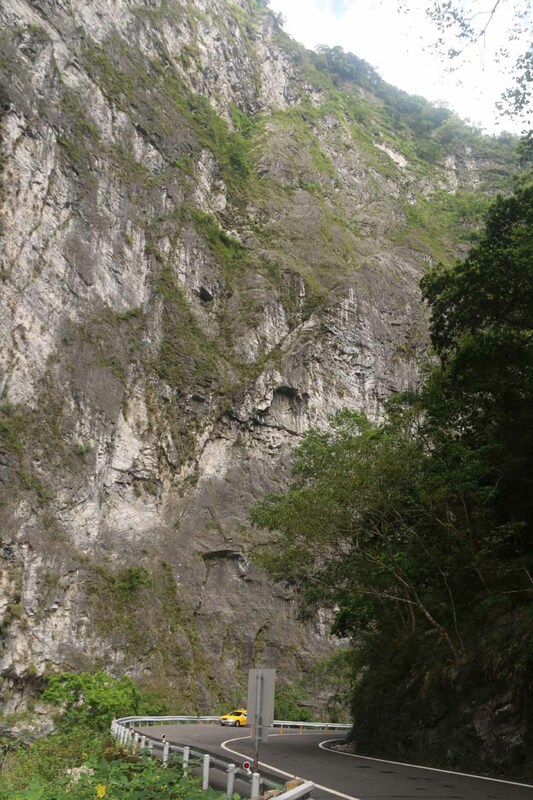 There were other attractive spots to take photos, but we had to pick and choose our spots under such limited time. 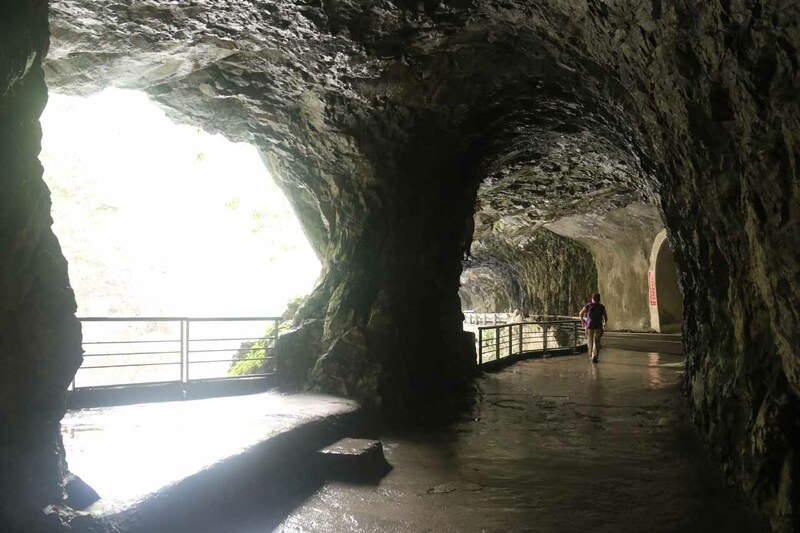 So if one were to have more time and walk (better yet bike) the gorge, then many of the attractions and photo spots would less likely be missed as opposed to if you were on a bus or driving by car with limited pullouts or parking spaces. 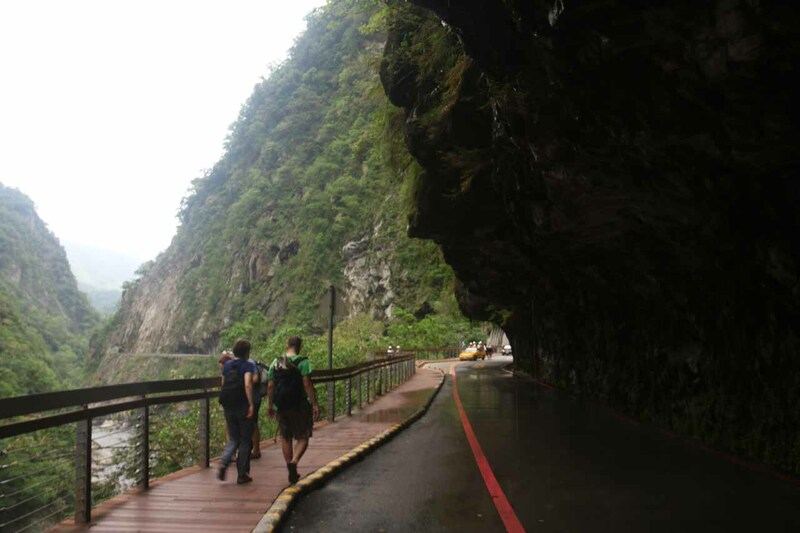 Something quirky that we saw during our walk was that most of the visitors were wearing hard hats to apparently minimize injury should a rock fall on you. 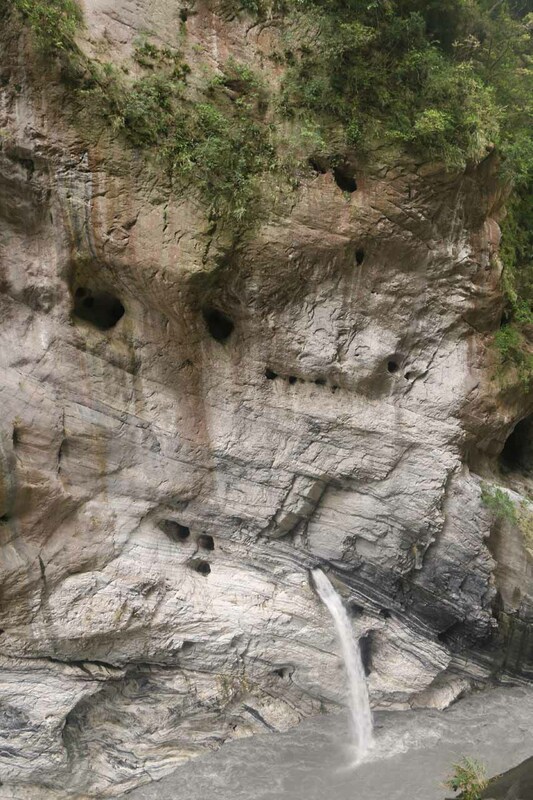 Mom and I wondered if even those helmets would be of any help should one be unfortunate enough to have a rock fall hundreds of meters onto one’s head, but I guess in the off-chance the rocks were the size of a golf ball or smaller then perhaps it would be of help. 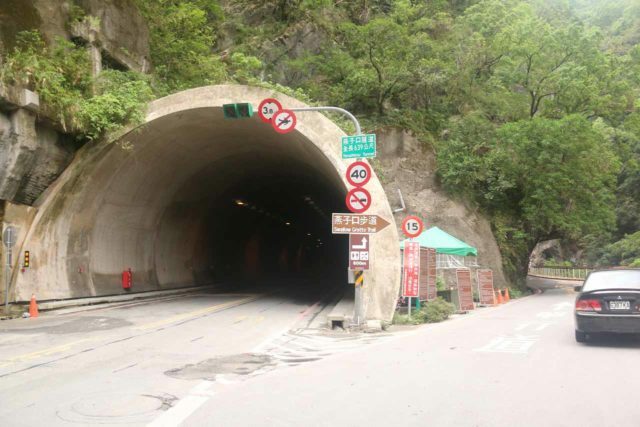 However, if it’s any kind of rock the size of a tennis ball or bigger, then I don’t think the helmet will help much in terms of preventing a fatality. 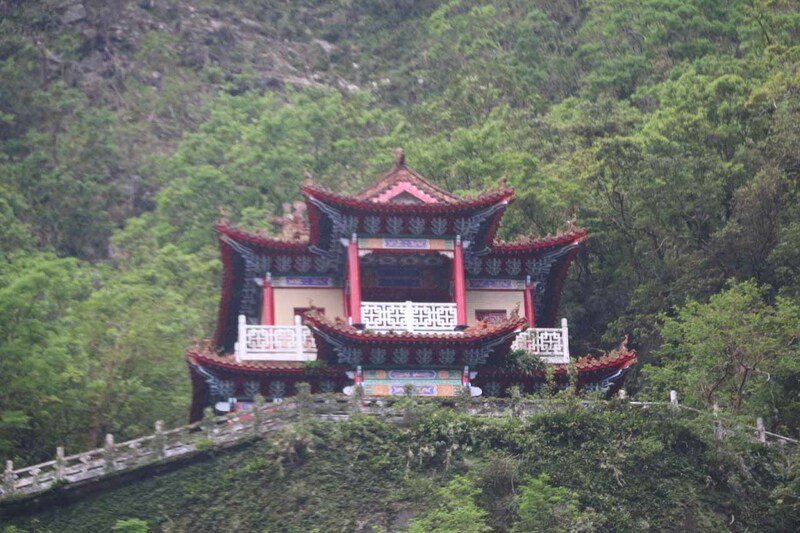 Not everyone wore one of these hard hats, but they were offered for free near the mouth of the Swallow Grotto area (there may be other spots where they’re distributed). 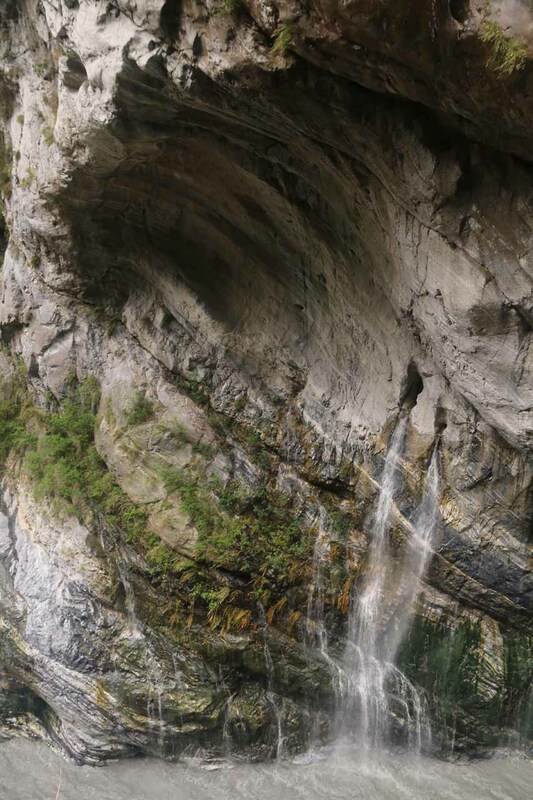 So that underscored the inherent danger of being within this area, but I’ve learned that often the most beautiful places in the world also tend to be the most deadly since the very forces that created such scenery also tended to be the same forces that could be destructive as well. 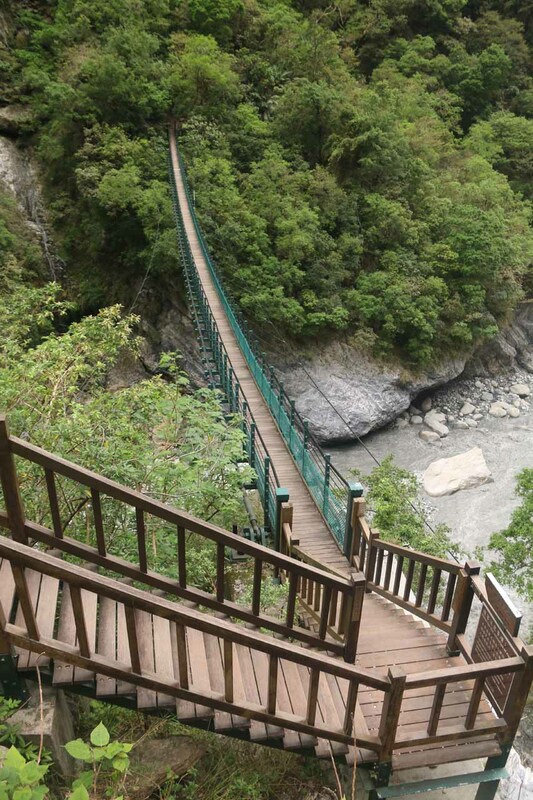 We made our visit to the Taroko Gorge (太魯閣 [Tàilǔgé]) by self-driving so this is how I’ll describe the directions. 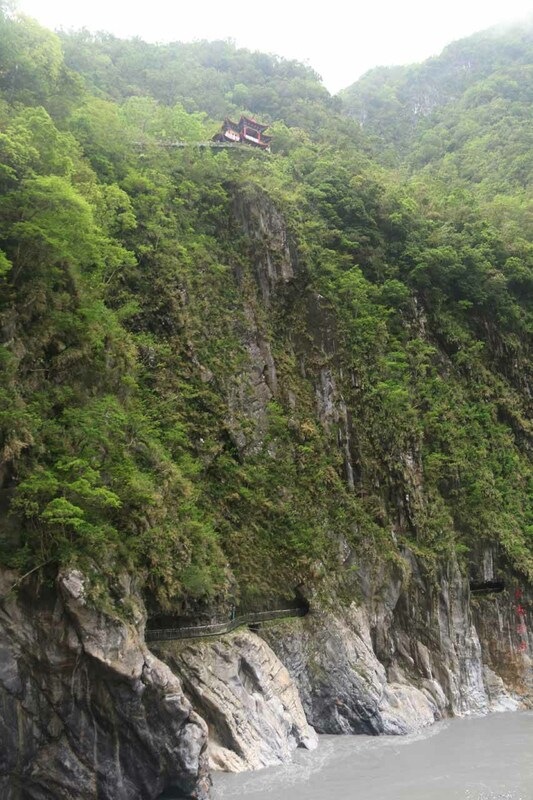 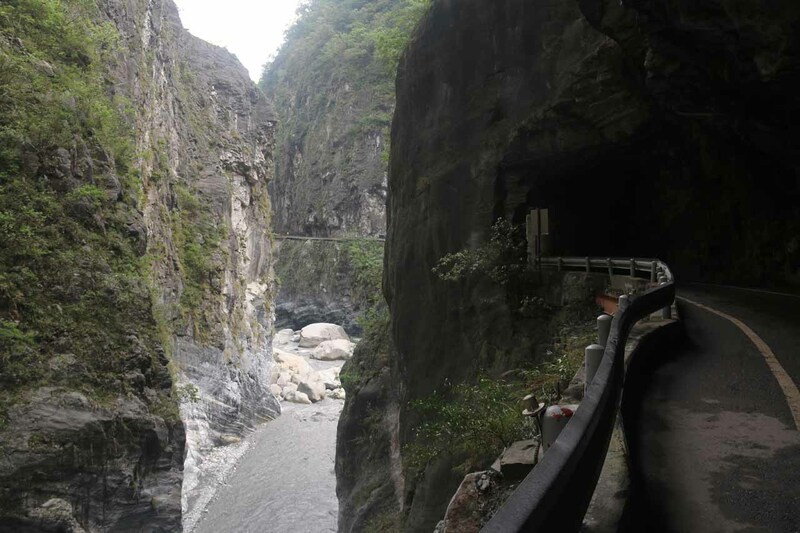 That said, most visitors (especially international visitors) visit the Taroko Gorge by taking a bus from Hualien (花蓮 [Huālián]). 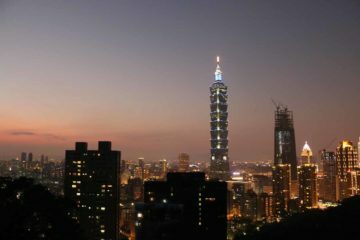 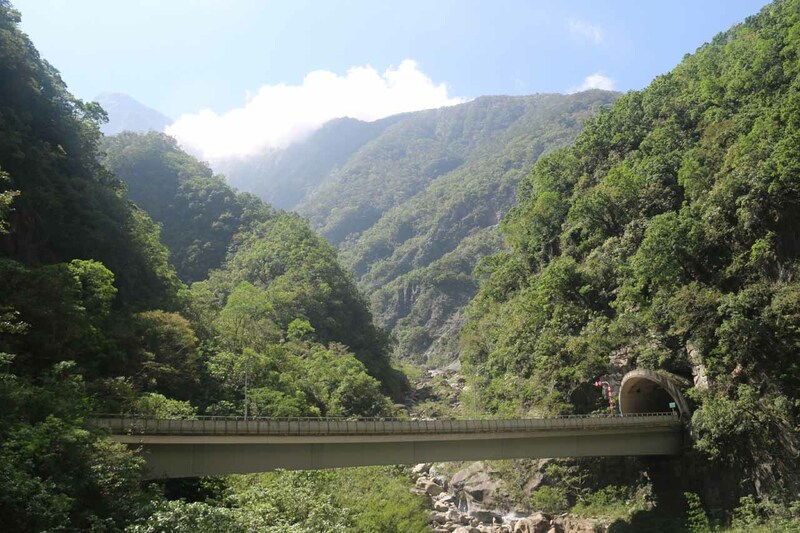 Prior to hiring a rental car within the city of Hualien (within a block or two from the train station), we actually caught one of the two-hour trains from Songshan Station (松山車站 [Sōngshān chēzhàn]) in Taipei to the Hualien Station (花蓮車站 [Huālián chēzhàn]) in Hualien City (花蓮市 [Huālián Shì]). Then, many buses leave from the station and head to the Taroko Gorge. 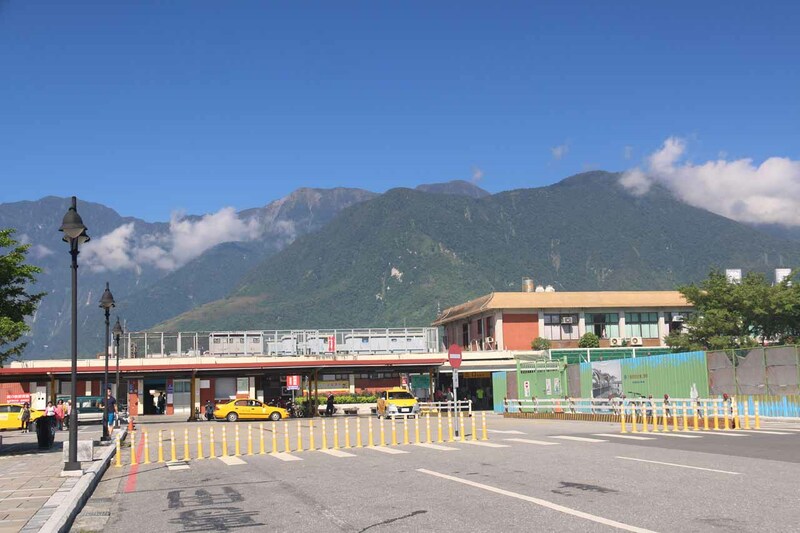 There were also many taxis waiting for people wanting a more customized experience on the fly without renting a car. Thus, transportation logistics didn’t seem to be an issue regardless of whether or not you have your own vehicle, but I’ve observed that the buses tended to leave you towards the mouth of the Taroko Gorge and any further exploration would require walking deeper into the gorge as well as walking back out. 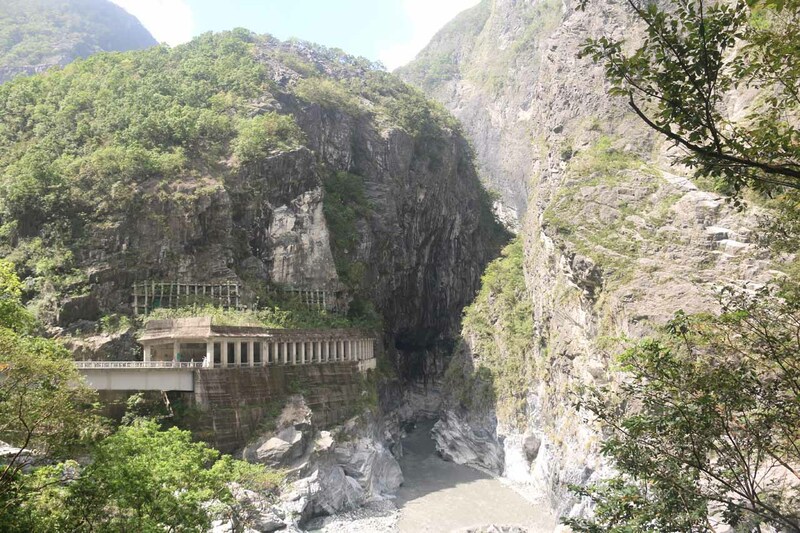 I’d say you would need a minimum of a half-day to even appreciate the Taroko Gorge, but you’d probably need more time than that to give yourself the chance to explore the best parts of the Taroko Gorge. 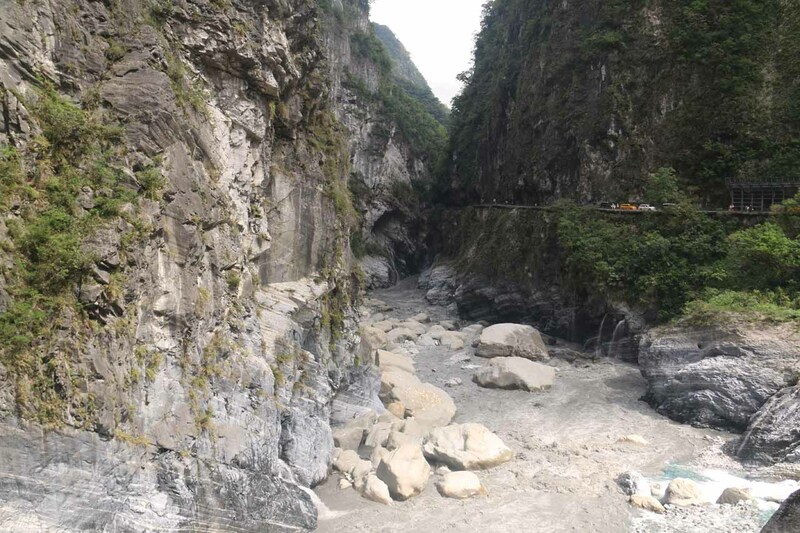 Anyways, once we picked up the car rental from Hualien, we then drove about 19km north along the Tai 9 (台力) Route to the mouth of the Taroko Gorge. 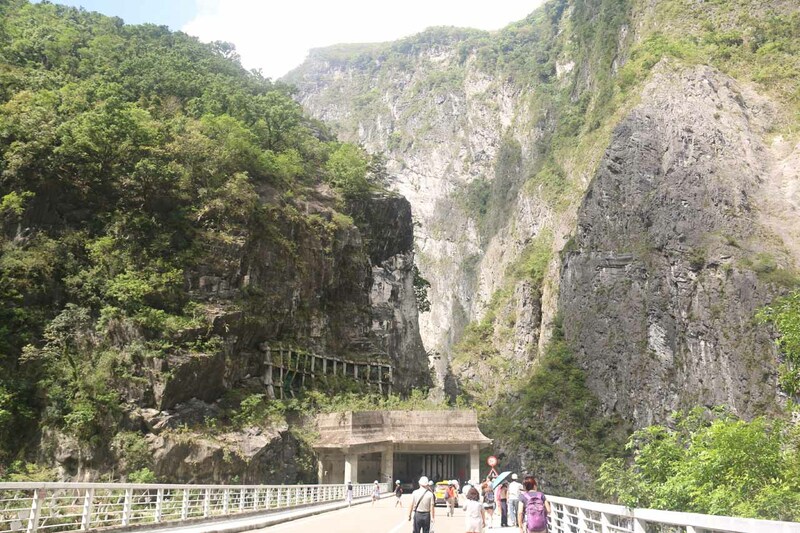 We then followed the signs and kept left to go into the gorge along the Tai-8 (台八) Highway (instead of crossing the Liwu River’s mouth on the right to continue on Tai-9 though technically we could have crossed that and then turned left to go into the gorge from the other side of the river). 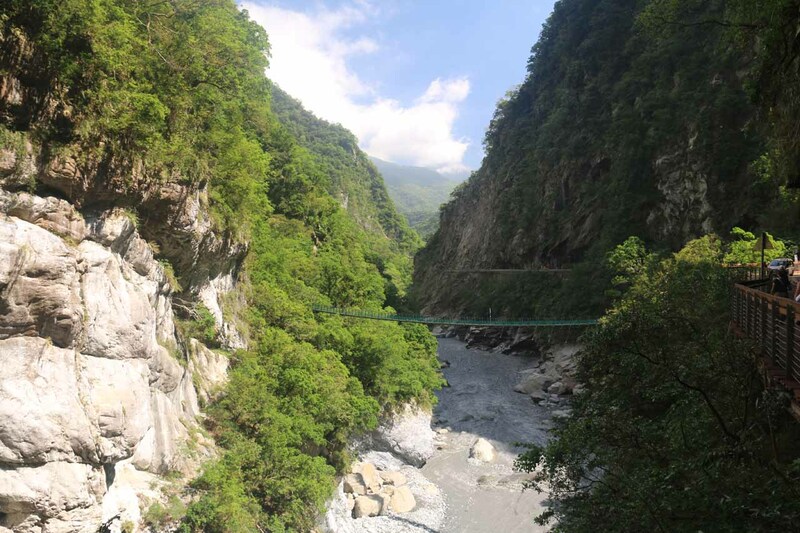 After another 3km or so, we kept right and crossed over a smaller bridge to continue west along the north side of the Liwu River (立霧溪 [Lìwū Xī]). 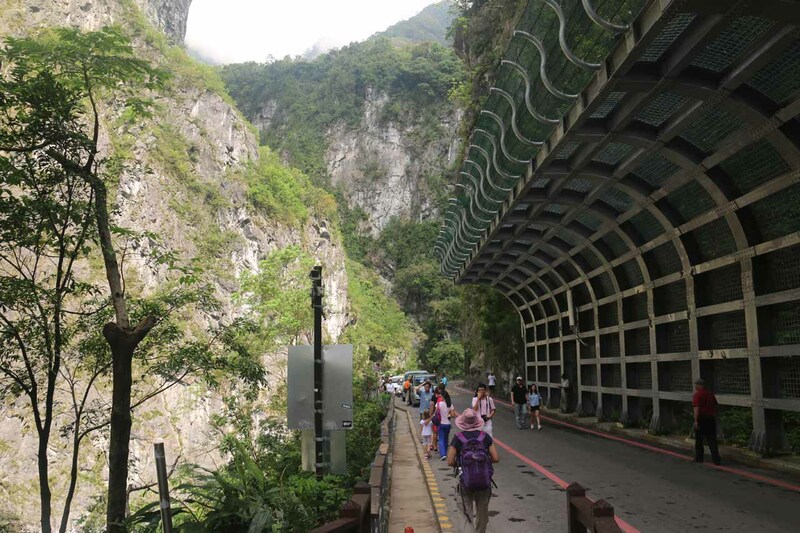 Note that the visitor center was just to the west of the north side of the bridge, which was where we saw lots of buses drop people off. 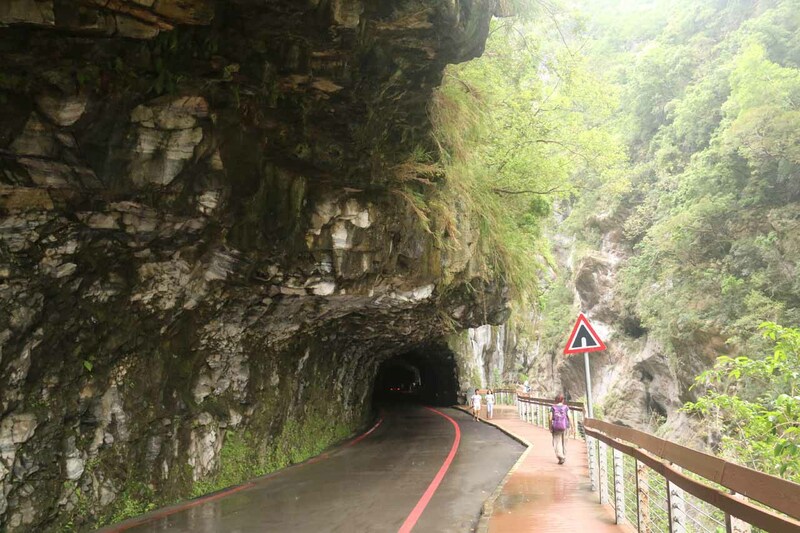 Then, after 9km we kept right at a fork (instead of heading into the tunnel on the left), which was the one-way entrance to the Swallow Grotto (燕子口 [Yànzǐkou]) part of the gorge. 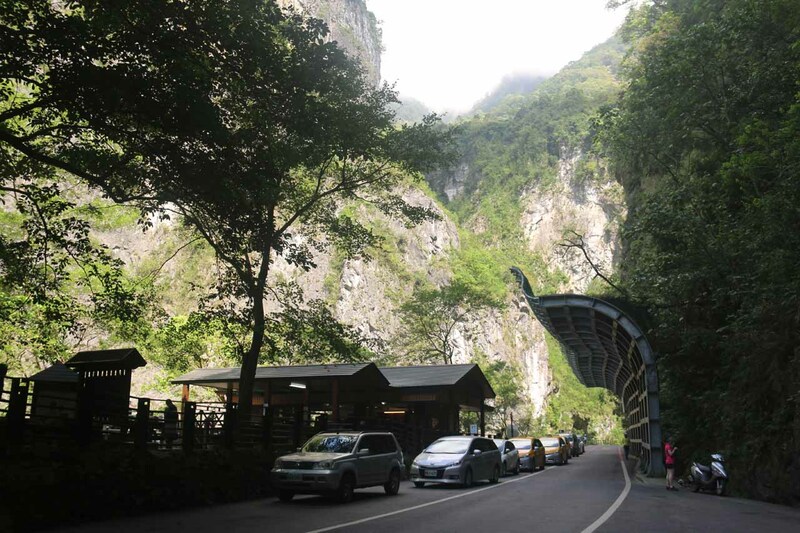 We definitely noticed foot traffic in this part, but parking wouldn’t be for another 1km where there was a cafe and several shoulders to park the car. 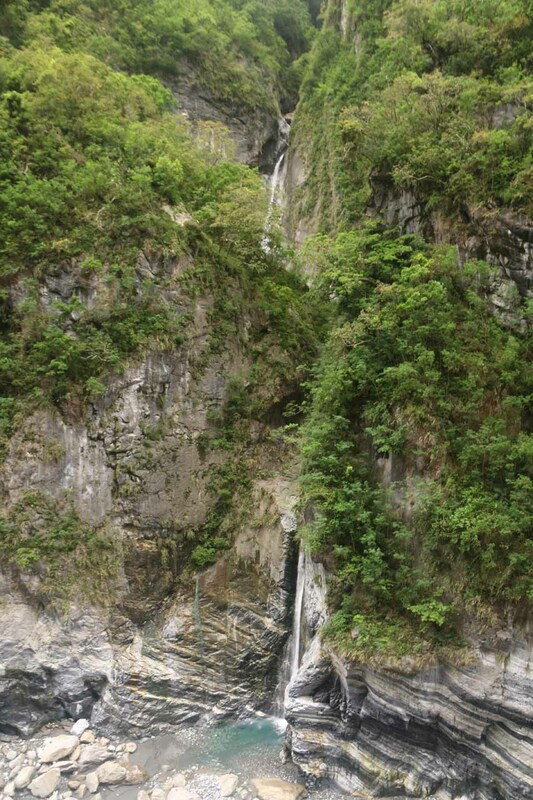 This was where we left the car and walked back towards the Swallow Grotto. 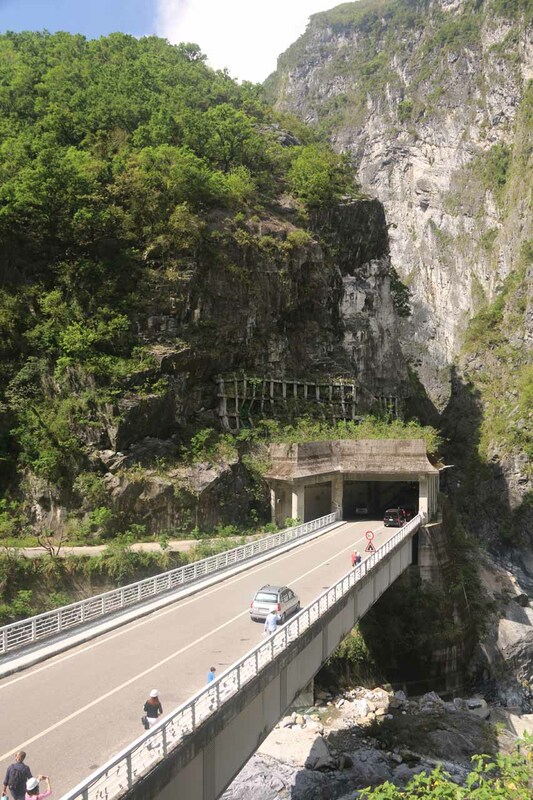 Overall, this drive took us around 45 minutes to cover the 32km distance. 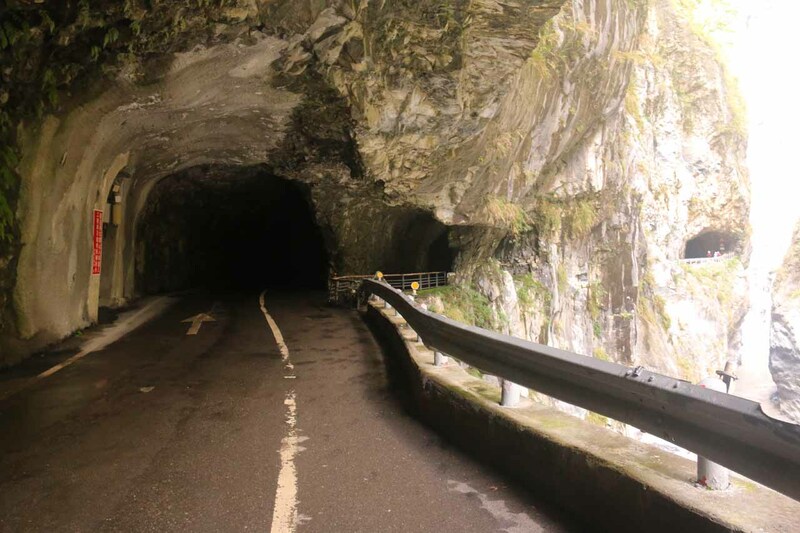 When we regained the car after visiting the Swallow Grotto, we then got out of the one-way section another 120m or so further before turning left to go east on Tai-8. Continuing east on Tai-8 for around 6km before keeping right at a fork (to void the tunnel on the left). 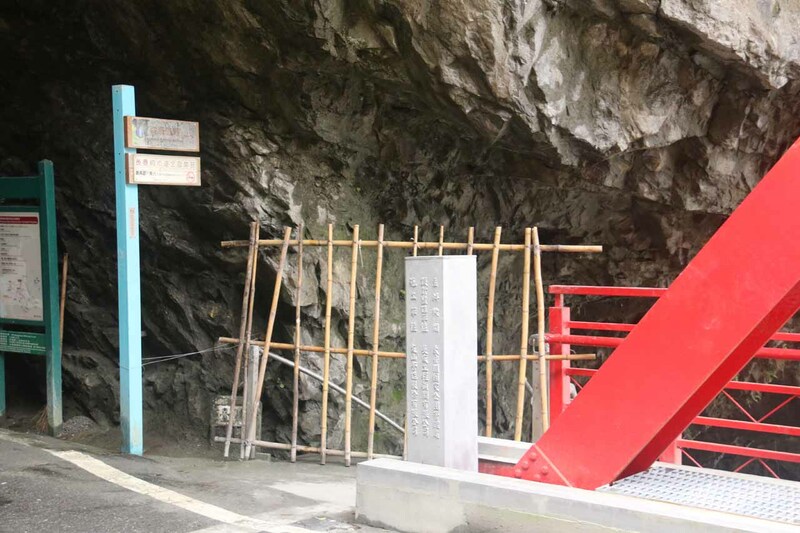 This fork led a further 1.5km to the parking for the Shrine of the Eternal Spring. After our having our fill of this spot, we were able to continue driving east to leave the gorge and eventually re-join the Tai-9 highway going south back towards Hualien. 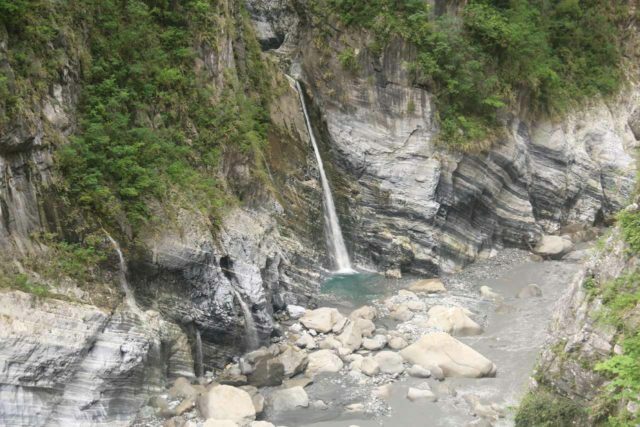 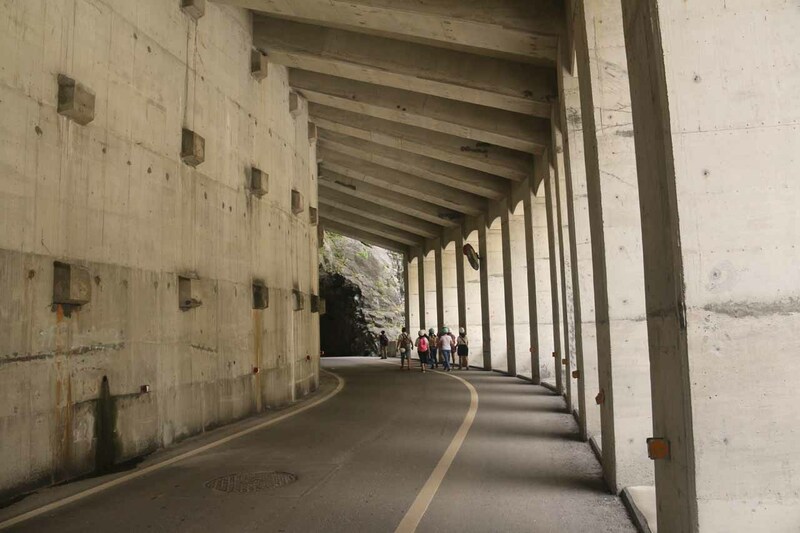 Just to give you some geographical context, the city of Hualien was the main base for excursions into the Taroko Gorge. 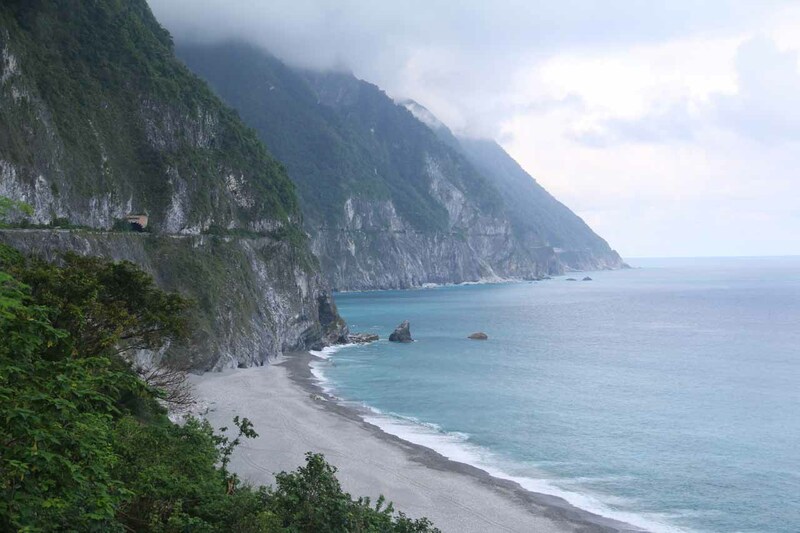 Hualien was 98km (over 2 hours drive) south of the Su’ao Township, 122km south of Yilan City (over 2.5 hours drive or less than an hour by train), and 173km south of Taipei (over 3 hours drive or 2 hours by train).